Our church purpose dictates why we discipline, how we discipline, and the ultimate objective of disciplining. 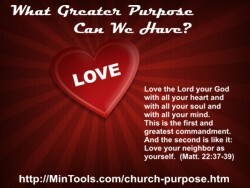 If our greatest purpose is to love God and others (Matt. 22:37-40), then we discipline in order to show love for God and people. We will look at church discipline in relation to God’s character and its effects on the Great Commission in future posts. In this post we will concentrate on the second point above, doing what is best for the erring believer. God already gave us the precedent in His love for how we deal with people living in sin. If we love others as He loves, then we will continue to love them regardless of what they have done. If we love others as He loves, then we will not be able to ignore their sinful ways. If we love others as He loves, then we will want them to reach their potential in Christ. If we love others as he loves, then we will not continue to hold their sin against them but will reaffirm our love for them. Failing to discipline when church discipline is needed therefore goes against God’s purposes — a topic for a new post. Subscribe to receive e-mail notice of new posts. This entry was posted in Church Discipline . I struggle with idea of church discipline like putting people out of the church. I can certainly understand yet it isn’t what is comfortable for us that should guide what we do in the church. God’s Word is the standard which does state that there is a time this might be necessary. “Putting people out of the church” comes after we have offered the person plenty of help, instruction, counsel, etc. but the person willfully remains in his/her sin. It certainly is not something we are to rush into or take lightly. And, it is with the hope that people realize the severity of their actions and repent. Restoration into fellowship with God and the Church Body should always be the desired outcome. Look for future posts as we’ll be getting deeper into how this is to be done, steps that should be taken first to hopefully avert the need for church discipline, and what our attitude should be all throughout the process.